Bundi was one of the Rajput kingdoms of Rajasthan which existed in the early modern period in India, located in the north-west of the country. It was centred around the city of Bundi. The Rajputs were Hindu warrior clans, and the word 'rajput' itself literally means 'the son of the king', with the people being known for their valour. 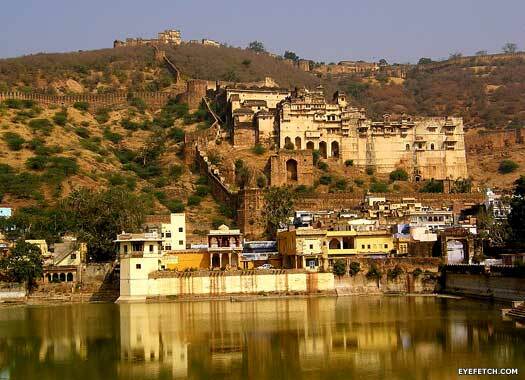 Bundi was ruled by the Hada Chauhan royal dynasty which derived its name from a Meena king named Bunda Meena. The kingdom was later taken from the Meenas by Rao Deva Hara in 1342. There were a number of small Rajput kingdoms which emerged between the sixth and thirteenth centuries, including Amer, Bikaner, Jaisalmer, Jodhpur, Malwa, Kannauj, Mewar, and all were eventually conquered by the Moghuls. Founded of the kingdom. Closely aligned with Sisodiya Rajputs. Son. Exiled by his younger brothers who converted to Islam. Son. Recovered his father's kingdom. The Moghul emperor, Akbar, gains the submission of Bundi, along with the other Rajputs of Bikaner, Jaisalmer, and Jodhpur. In Bundi's case, Surjan Singh surrenders Ranthambore fort to Akbar. He had been governing it on behalf of the Sisodiyas of Mewar but with this act he becomes a Moghul vassal and is rewarded with extra territory. Bundi Palace, situated adjacent to Taragarh Fort, was built during the sixteenth and seventeenth centuries. Son. Gained the title of raja from the Moghuls. Emperor Jahangir continues the Moghul campaigns against Mewar, but when the emperor's son, Prince Karan Singh, rebels against his father with the support of twenty-two Rajput kings, Ratan Singh remains loyal to Jahangir and helps to defeat the rebellious prince. Chatra Singh is made governor of Delhi by Prince Dara Shikoh (the son of Moghul Emperor Shah Jahan), but he dies fighting against Shah Jahan's successor, Aurangzeb. Bhao Singh fights against Emperor Aurangzeb, but is later reconciled with him, becoming a Moghul vassal. He subsequently fights in the Deccan against the growing power of the Marathas. 15 year old son of Bhao Singh's adopted son, Kishen Singh. Anirudh Singh served Aurangzeb in the Deccan. He is later transferred to the north-west under Prince Muazzam, where he dies. His successors are briefly expelled from the kingdom, before it can be regained by Dalel Singh. Churaman of the Jat kingdom of Bharatpur is determined to clear Jat lands of the Moghuls. He builds up an army and even constructs a fort at Thoon (near Agra). A large number of Jats gather under his leadership, including Khemkaran Sogaria, a Jat chieftain of the Sogaria clan, and he generates additional funds by raiding the regions of Bundi and Kota. He soon wrests Sinsini and Amber from the Moghuls, and in the process forms a powerful regional kingdom. Son. Exiled by the Jaipur forces of Jai Singh II (his brother-in-law). Adopted son (from Raja Salim Singh Hada of Karwar). Son of Rao Budh Singh. Son. Credited with assassinating Rana Ari Singh II of Mewar. Son. Enlisted British protection against the Marathas. Son. Popular reformist. Col James Todd was regent & guardian. Son. Made KCSI & GCSI and supported Britain in WWI. Brother. Honarary aide de camp to King George VI. Adopted son. Served British Army in WWII. Awarded Military Cross.